New global shipping fuel rules promise to upset the world’s crude slate for a couple years—causing havoc for investors and producers. In Part I, I explained how much pollution the shipping industry creates, and how shipowners are adapting. In Part II here, I explain what macro concerns there are for refiners, heavy oil & US shale oil producers, and gasoline around the world. According to The Canadian Energy Research Institute (CERI), the worldwide refining complex produces about 3.2 mbbl/d of HSFO—High Sulphur Fuel Oil that is used in about 65% of the worldwide shipping fleet of 90,000 ships rely on HSFO. This is from worldwide demand of a little over 7 mbbl/d. Scrubber installations and non-compliance (this would be shipowners just ignoring the new environmental rules) will preserve some of that demand; Goldman Sachs says about 1.7 mbbl/d. The rest will be replaced by low sulphur fuels–LSFO. This means big changes to the balance of products produced by refiners. But changing the product mix is easier said than done. Simple refiners, like those in the developing world can’t really do much about their mix. That’s a big reason compliance in the developing world is expected to remain low. They are going to have too much heavy fuel oil. Complex refineries in Europe, North America and in China have more options. For one, they can better utilize existing coking capacity. Coking takes heavy residual oil from the primary refining circuit, breaks apart the longer hydrocarbon chains and produces light fuels and naphtha. North American refineries now have excess coking capacity. The onslaught of light crudes from shale plays has meant that many refineries designed to take in heavy oils have shuttered some of their coking capacity. That capacity will now get fired back up. Second, complex refineries have more flexibility in feed stocks. And that’s going to impact the crude market. If you thought the shifts in refined products were difficult to keep track of, wait till you look at oil. Remember, crude oil is really a mix of different hydrocarbons. Refining is separating that mix into many different products; what products are produced depends on the type of crude. As a rule of thumb, a light crude produces light products, like gasoline and naphtha. A heavy crude produces heavier products, like fuel oil and even asphaltines. 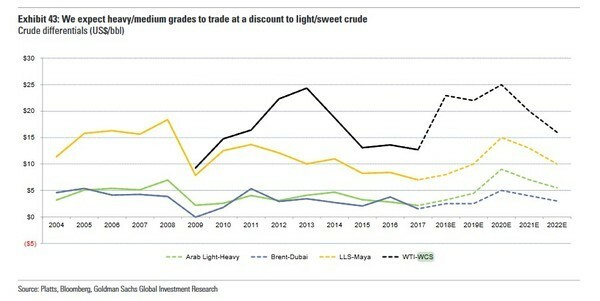 Not surprisingly the big winner from IMO 2020 are expected to be the light crude benchmarks, like Brent and LLS—Louisiana Light Sweet. These crudes have strong “middle-distillate” yields. A middle-distillate refers to a range of products that are heavier than gasoline but lighter than fuel oil. Low sulfer marine fuels—LSFOs–will be made of various middle distillates. So IMO 2020 should be good for light oils – but only if they aren’t too light. It could turn out to be a negative for very light oils – like what comes from US shale. Shale oils are so light that they don’t produce a lot of middle distillates. Morgan Stanley pointed this out earlier in the year, saying they expected to see North American light oil discounts. One reason was refining capacity, which isn’t equipped to handle the volumes. The other reason was that they expected “middle distillates” to account for much of the demand growth. And if US shale oil doesn’t make them, then demand for that same shale oil could be lower. Finally, what does the rule change mean for heavy crudes like Western Canada Select (WCS)? It’s likely negative, but just how negative is anyone’s guess. WCS has a high sulphur content and on the face of it, that should lead to more of a discount. But there are others that aren’t so sure. Much will depend on which products command the best prices and how refineries can maximize the output of those products. Some think that shale oils could be the bigger victim. A heavy sour crude like WCS produces a lot more middle-distillates than light shale oils and it won’t run the risk of flooding the market with gasoline, which is a primary product from light shale oils. A lot is going to depend on product prices and refinery runs. To sum it up, it’s about as clear as mud. And that makes it tough to plan strategies for investors, producers, refiners and large gasoline consumers as it’s just not clear yet who will be the winners and losers will be—despite there being billions on the line here. Apart from the competitive advantage for ships that have scrubbers, the rule change will likely be a net positive for the shipping industry. High fuel costs will encourage slow steaming (which lowers fuel consumption). Slower ships is effectively reducing supply. Estimates are that the result is an “effective” reduction of the global fleet of between 2-3%. A second consequence will be that more of the older ships (>15 years)–that can’t justify scrubber retrofits and have poor fuel efficiency–just get scrapped. One vessel type that is uniquely positioned are clean product tankers (MR, LR1 and LR2). Clean tankers typically carry products like gasoline, jet fuel or diesel fuel. The shift to middle distillate marine fuels means increased demand for these vessels. Scorpio Tankers (STNG-NYSE) CEO Robert Bugabee recently said that even at the low end of forecasts you are still looking at 6% incremental demand for clean tanker vessels. As for timing, the deadline is January 1, 2020, but if the fuels are going to be there on time, the changes need to start before then. The Market is already seeing scrubber orders stack up. Soon (maybe early to mid-2019) the refiners will begin to shift product. Charter rates on ships will begin to rise. It’s going to be a whole new world come 2020. I have found one investment as a play on IMO 2020 that is already looking like a winner–up 40% in just two weeks! But I’m looking for even more. Be ready when that happens—because these oddball stocks that I find in the corners of the global energy complex—like LNG shipping in 2010 and ethanol stocks in 2013—are often my biggest wins! Sign up for your risk-free trial to my OGIB service TODAY—click HERE. Do Broken Chinese Teapots Hold The Key to Oil Prices?